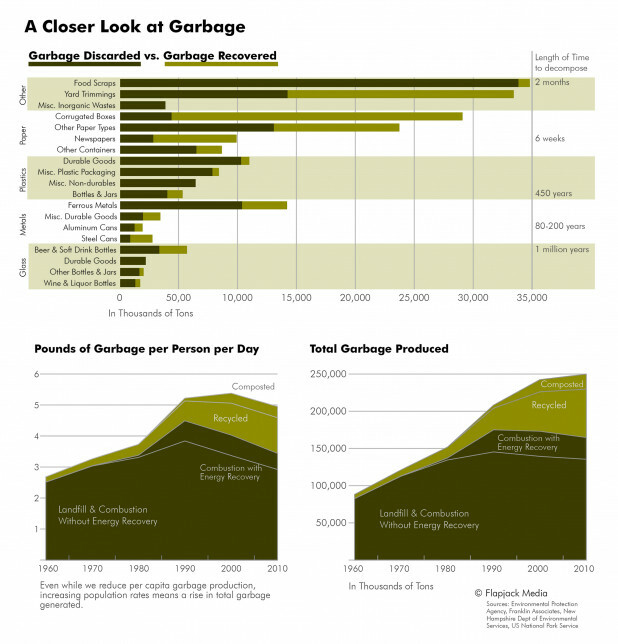 Steph Guinan recently finished an infographic on garbage creation in the US. This is some of what she discovered during her research on the topic. The EPA estimates that each person in the US produces 4.43 pounds of garbage per day. With a growing population, even moderate attempts to reduce the cycle of consumption and disposal have not been enough to plateau the country’s total trash production. When considering the ways in which we interact with our environment, it is critical for us to examine and understand our waste. Data visualization can aid this understanding and better equip us to adjust our consumption and disposal habits. A Closer Look at Garbage infographic by flapjackmedia. Waste management is a $55 billion industry, according to the Waste Business Journal. Projections of growth expect the industry to reach $60 billion by 2016. The data has shown that waste management is an economic area that is nearly recession proof. Even in hard economic times, disposal of trash is a public service that still must be addressed. Although increases in total trash production may be good for the garbage business, it has a lasting environmental impact that warrants researching greener solutions. When taking a critical look at the trash generated by our households and businesses, the first step is to closely review the materials we consume. The easiest step in reducing our waste is to make smarter purchasing choices by selecting products with less packaging and looking for alternatives to single-use products. Before making a purchase, we might also consider second-hand products or reach out to community members to share resources and tools. Of the four methods that broadly categorize trash disposal, recycling and composting are the most environmentally friendly. Even with the resources used to recycle glass, aluminum, and plastic, there is a net positive when compared to the resources saved in production of new material and the cost of other disposal methods. Landfills and incinerators both have significant environmental impact. Incinerators are known to have a tremendous effect on air quality, and there has been increased documentation of health impacts that result from this pollution. It is also widely known that landfills are a source of pollution when protection systems break down, and they leech toxic chemicals into the ground and water. With so much pollution resulting from our garbage, it’s hard to imagine that anything good could come from these processes. However, there have been small steps to generate energy from our garbage by recapturing the byproducts of combustion and harvesting the methane released from decomposition in landfills. The most significant components of US waste are food scraps and yard trimmings. Although more than half of all yard trimmings are composted, only 3% of food scraps are composted after they enter the waste cycle. Publicly available compost units have had a significant impact on preventing more trash from entering our landfills. However, this compost data does not reflect any garbage that is addressed before it enters the waste stream. Backyard composting is an alternative to waste disposal and reduces our environmental footprint. A DIY compost system is easy to start at your home, business, or school. Steph Guinan is a freelance data visualization designer located in the mountains of North Carolina. You can keep up with her latest projects at flapjackmedia.wordpress.com.